Notley Fellows tackle our community’s hardest and most intractable challenges while pursuing constant self improvement. Fellows work directly with a network of Austin's foremost experts and leaders, all while learning, growing, and sharing ideas. The Fellowship provides valuable opportunities to learn about strategic, entrepreneurial philanthropy, new funding options, and scalability models. Fellows can observe, offer insight, and participate in thoughtfully curated projects with real impact. Austin is home to multiple universities and colleges that play vital roles in our community. By partnering with those universities, we can accomplish more, engage the city's youth, and bring our diverse communities together for the betterment of Austin. Fellows can work with the Notley team to help nonprofits scale their missions and maintain financial sustainability in Austin and beyond. Notley helps many organization to grow and scale. One of Austin’s best assets is it’s technology resources. Help Notley apply the right technology to move community solutions forward for our most intractable problems. Tackling community challenges at an ecosystem level is what Notley does! Many times, this involves land, office buildings, education space, and startup accelerators. Fellows can worth with Notley to design places that empower the broader community collaborate. The city, surrounding municipalities, and government organizations play a critical role in advancing many of community’s needed solutions. Help us create policy and political strategies that encourage our officials and government organizations to be advocates for positive change. Work with Notley's consulting team to solve operational and growth challenges for our nonprofit partners. We love supplementing teams so that great organizations can focus on what they do best! 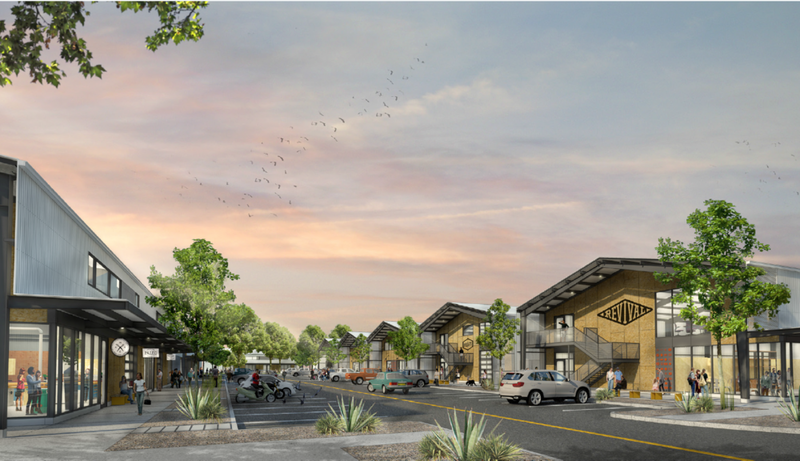 Partnering with Springdale General, The Center for Social Innovation is being built to tackle long-term commercial affordability and serve as a permanent home for Austin's social innovation ecosystem. Together nonprofits, social enterprises, city innovation leaders, capital providers, incubators, accelerators, universities, and advocacy groups will gather and collaborate in the space to foster new ideas and create inventive solutions to our biggest challenges. The Startup Games unites startup companies in friendly competition to build great cultures while giving back to their local communities. Companies compete in an Olympic-style event for a day of fun, networking, and philanthropy. Each company's team plays for the nonprofit of their choice, and at the end of the day, each nonprofit walks away with a grant — the largest grants are awarded to the nonprofits supported by the 1st, 2nd, and 3rd place teams. Philanthropitch is a social impact fast-pitch event that helps innovative nonprofits scale sustainable models. Founded in 2013 in Austin, Texas, Philanthropitch has awarded more than half a million dollars to empower nonprofits to expand their impact. Judges include successful business leaders, entrepreneurs and philanthropists who deeply care about the community. Judges personally contribute to organizations that stand out to them after they hear the pitches. Contact fellows@notleyventures.com to learn more about other projects that our Fellows are involved in.